from our Family to your! Remember, it’s easier to cut a dress down than to try to make a dress a bigger size. Always remember that gown sizes may be, and often are, very different than regular clothing. You order your gown to fit your largest measurement size. So, if your bust equals a size 12, your waist a size 10 and your hips a 10, you would order the 12. Ultimately, the choice of what size to order is always yours. We do recommend, however, that if you’re right on the edge of two sizes, order the larger. These are the following measurement you will need to know to order your dress: Bust, Waist, Hips, and Hallow to Hem. Please do not attempt to take your own measurement because most likely they will be wrong. 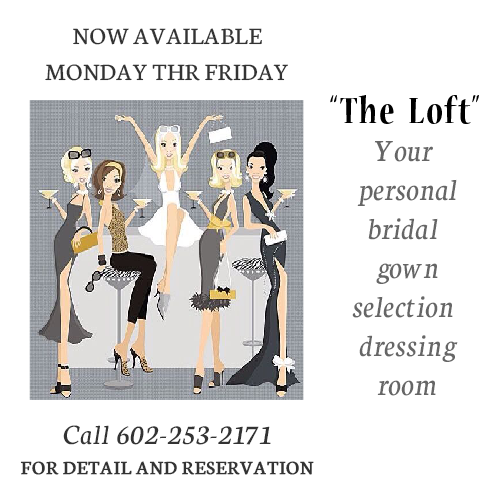 If you need help or have any questions, call us at (602)253-2171 Please review size charts according to the designer of your dress. In order for us to provide the very best possible service, brides wishing to shop for wedding gowns in our store, are asked to make an appointment. Appointments are typically 1.5 hours, during which time the bride will work closely with a bridal consultant to find that special dress! Plan to bring your most trusted family members and/or friends to accompany you. Too many people can be overwhelming, but please feel free to bring the people you need to help you make this decision. We can only accommodate 3-4 seats per bride. If you have a larger group please call us (602)253-2171. Before your appointment. Determine your ideal budget and the type of style you are looking for. This information will be helpful for you and your consultant start on the right track. Tip: To help us give you the best service and find your dream dress we recommend you browse and bring in some picture of dresses you might like. Pinterest and Instagram are great sources when it comes to browsing you dream dress. Visiting our store: Come in to our store let the front desk representative you are going to place an order. If you are in a bridal party ordering the dresses from our store let the representative know the brides first and last name and wedding date as well. Phone Orders : To order by phone, please contact us Mon. Wed. Th. 12-7 Tue. & Fri. 12-6 602-253-2171. A customer service representative will be happy to assist you. Priority Domestic U.S. – Usually delivers within 2 days. Express Domestic U.S. – Overnight delivery to most locations. Priority International – 6-10 business days to most locations. Express International – 3-5 business days to most locations. These time frames do not reflect the production of your order. Standard delivery from the designer to Azteca Bridal is approximately 10-16 weeks. Most designers offer a Rush delivery of approximately 4-8 weeks. Please check the “When Will I Receive This Product” button on the product detail page to view the estimated designer shipping times. If Rush Shipping is available, it can be selected for an additional charge when placing your order. All sales are final and cannot be cancelled after point of purchase. Unfortunately, due to the special nature of our merchandise, we are unable to accommodate refunds or exchanges under any circumstances. Once an order is placed, our manufacturers are also unable to cancel, make changes, or modify any order. Before placing your order, please be sure of the style, color, size, and any other specifications before you submit your order. The submission of any order fully acknowledges your agreements to these Terms & Conditions. We do not accept returns or exchanges on any ‘In Stock’ Items. Wedding apparel is considered a special-order product and usually takes 10-16 weeks for the designer to construct your dress and ship to our location. Depending on the manufacturer and product; quick delivery, rush delivery or in-stock options may be available which reduce the time it takes for Azteca Bridal to receive your dress. These times can range from 2-8 weeks. A rush charge can be added if needed, but it will all depend if the company offers a rush charge. Group orders should be placed as one order to maintain color consistency. If you order dresses individually, the dresses may not be produced from the same dye-lot which puts you at risk for varying colors. Also note: each manufacturer’s colors are different from one to another and are not comparable. Dresses are order once all the sizes and deposits have been obtained. Can I Order Directly from the Designer? Designers will only accept orders from authorized retailers such as Azteca Bridal. Designers are unable to communicate directly with customers regarding order status. ALL sales are final and cannot be cancelled. Unfortunately, due to the special nature of our merchandise, we are unable to accommodate refunds or exchanges under any circumstances. Once an order is placed, our manufacturers are also unable to cancel, make changes, or modify any order. Before placing your order, please be sure of the style, color, size, and any other specifications before you submit your order. The submission of any order fully acknowledges your agreements to these Terms & Conditions. We highly recommend placing all orders as far in advance of your wedding or event as possible. You and/or your bridal party will want to permit sufficient time for the production, shipping, and any alterations that may be necessary. Our manufacturers reserve the right to change their delivery time frames at any point in time without any advanced notice. Once again, all sales are final. The estimated delivery given in the order confirmation indicates the time frame the manufacturers will ship the order to our specific location. The time frame is an estimate only provided by the manufacturers. Due to specific cutting dates of their styles, manufacturers do not guarantee their delivery dates. Delivery dates are tentative and subject to change. On occasion, there may be a slight delay in production, which affects the order’s delivery to Azteca Bridal. Please be assured we take every measure to ensure orders are delivered in the timeliest manner. Our manufacturers create and provide their own sizing charts, which reflects the specific measurements they use to cut and determine their sizes. It is imperative to follow the vendor’s size chart for the product to choose the size to order. Please note measurements are taken to determine the closest size to be ordered and the garment will not be custom-made to exact measurements. Almost all apparel will need some type of alteration. The vendor is unable to accommodate any changes to the size once the order has been placed. The customer is responsible for the size ordered and whether or not to order extra or custom length. Azteca Bridal cannot assume any responsibility for the size selected by the customer. Colors that are displayed on any website may vary from the actual fabric colors. We highly recommend contacting a local authorized retailer to physically view a fabric swatch of the manufacturer you are interested in ordering. Dress colors cannot be compared across different manufacturers. Please indicate the color you wish to order exactly as it is posted on our site. Many dresses are available in two-tone combinations and with trims. The customer is responsible for the color ordered. Once an order is placed, manufacturers will not make any changes or modifications to your order. All sales are final and cannot be cancelled. We cannot accommodate exchanges or refunds. Additional charges may apply for certain order specifications including, but not limited to rush charges, plus sizes, extra length, and Hollow to Hem measurements. Availability and charges for these specifications will vary between manufacturers and will display with each product. Azteca Bridal is not responsible for the maintenance of our manufacturers collections. The manufacturers determines the availability of their styles. Manufacturers can discontinue a style at any time and without advance notice. manufacturers reserve the right to modify or discontinue styles, colors, options, and prices at any time. We update our website upon the manufacturers notification. We reserve the right to change prices, terms, specifications and warranties without notice. We endeavor to accurately describe every product offered for sale; however, mistakes can sometimes be made. Any typographical, photographic, or specification error in product description, pricing or offers is subject to correction and verification. Azteca Bridal reserves the right to add, modify, or omit any information. Please remember all orders are final and cannot be cancelled. Under no circumstances can Azteca Bridal accommodate any exchanges or refunds. The customer is responsible for the size, color, and any other specifications of their order. You are granted a non-exclusive, non-transferable, revocable, limited license to access and use this Website on any single computer for personal, non-commercial use. Azteca Bridal may terminate this license without notice at any time and for any reason.